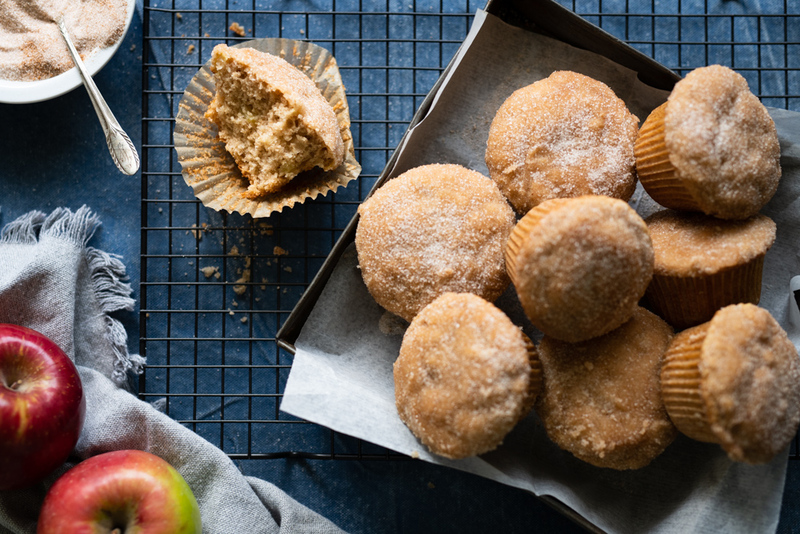 Savor warm fall spices in these apple donut muffins topped with crisp cinnamon sugar. Soft chunks of apple pepper these original muffins that are reminiscent of old-fashioned sugar-dusted donuts. 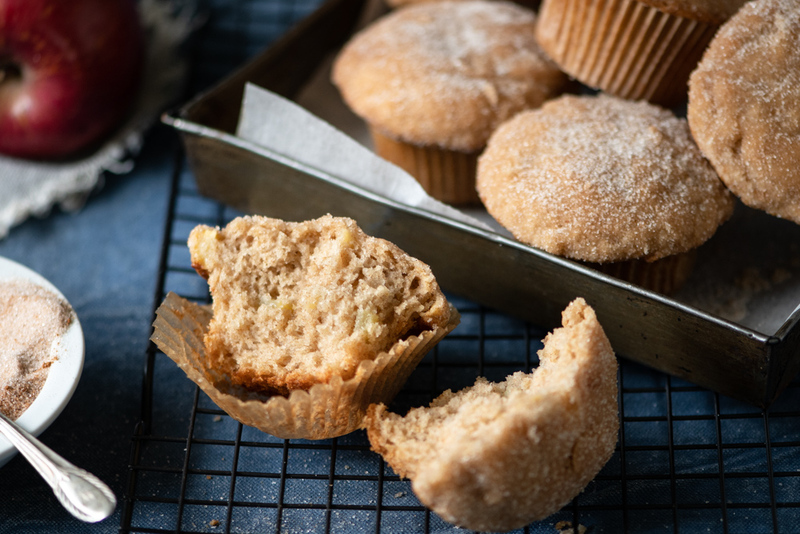 The apple donut muffins are made healthier and extra-moist by swapping eggs for applesauce. This also makes them easy to adapt to egg-free and vegan diets, for which we have provided notes in the recipe below. Pre-heat the oven to 350°F / 180°C with the rack in the center. Prepare the muffin pan by greasing the bottom and sides of each cup. Alternatively insert a paper cupcake liner into each cup. In a large bowl, sift all the dry ingredients together: all-purpose flour, whole wheat flour, sugar, baking powder, salt, nutmeg and cinnamon. Stir to ensure everything is well combined. In a separate medium bowl, thoroughly combine the milk, vegetable oil and applesauce. Pour the wet ingredients into the dry and use a spatula to mix the ingredients together. Stop mixing when the ingredients are well combined and no flour is showing. The batter should not be smooth. Do not overmix as this will make for tough muffins. Gently fold in the diced apple. Portion out the batter into the 12 cups using an ice cream scoop or large tablespoon. Place in the oven and bake for 20-25 minutes until the tops of the muffins spring back and a toothpick inserted in the center comes out clean or with a few crumbs. While the muffins are baking, prepare the ingredients for the topping. Place the melted butter in a bowl, then in a separate bowl, thoroughly mix the sugar and cinnamon together. When the muffins are done, remove from the oven and place on a cooling rack for 5 minutes. Carefully remove the muffins from their cups and place directly on a cooling rack. As soon as the muffins are cool enough to handle, finish them with the topping. Carefully take a muffin and dip the top (the whole top, not just the tip) in the butter and let the excess drip back into the bowl. Then roll it gently in the cinnamon sugar, allowing it to coat the entire muffin top. Place on the cooling rack and let cool completely. Repeat with the 11 other muffins. These apple donut muffins are best eaten the day they are made but they can be stored in a sealed container for 2-3 days. If you want to freeze them, let them cool completely without the topping and store them in the freezer for up to a month. Thaw out and then add the topping as instructed in the recipe. Don’t throw away the leftover cinnamon sugar! Sprinkle it on buttered toast, oatmeal or breakfast cereal. You can also stir a spoonful into your afternoon tea for an extra warming cup.